The city of Bangkok is a wonderful place to find reptiles and amphibians, or “herps”. Minuscule narrowmouth frogs and blind snakes hide in the gardens while magnificent monitors and pythons roam the canals. This website will help you identify the herps you find and learn more about their contribution to our ecosystem. Read stories about herping on the Herping Adventures in Bangkok page. An article on my experiences in Bangkok and other Asian megacities can be found in the July 2012 issue of Herp Nation Magazine. This website covers Bangkok and the surrounding area. Some photos and accounts for species outside Bangkok can be found at the bottom of this species list. For more information on reptiles throughout Southeast Asia, check out A Field Guide to the Reptiles of South-East Asia and A Photographic Guide to Snakes and Other Reptiles of Peninsular Malaysia, Singapore and Thailand at any English-language Bangkok bookstore. Explore the site, leave comments, and happy herping! Note – all text information on this blog is © 2019 Jonathan Hakim, under a Creative Commons Attribution-ShareAlike license: http://creativecommons.org/licenses/by-sa/3.0/. The photos retain their individual copyright by photographer. Please ask for permission before using any photos from this site. awesome site, keep the herp dream alive! 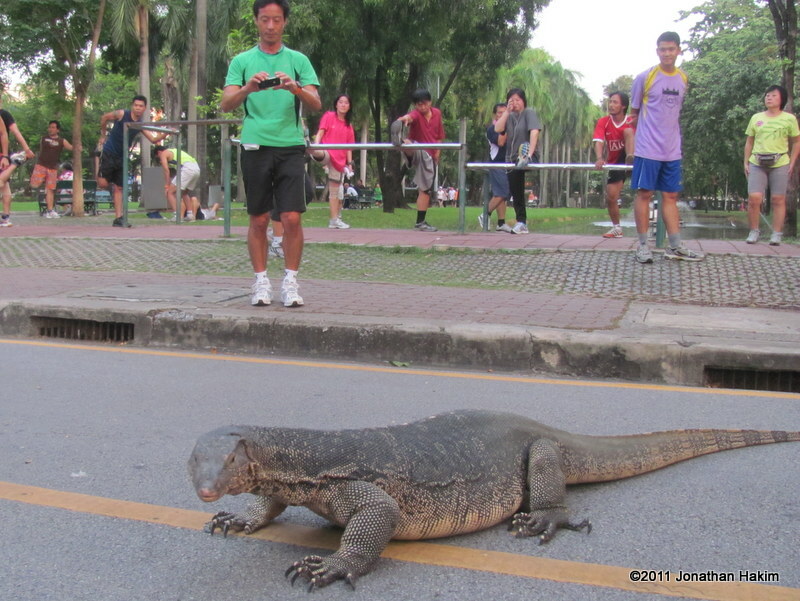 I remember visiting the park in Bangkok Thailand and thinking that I had spotted some rare giant Lizard. I scrambled to get a photo of this elusive Thailand monster. I later discovered these monsters “Water Monitors” are quite common in Lumpani park and not that elusive. I still think they are some really cool reptiles. Great blog! I intend to go herping some day in Thailand and Southeast Asia and actually already bought that book that you mention A Field-Guide to the Reptiles & Amphibians of Southeast Asia. I LOVE your photo of the monitor too. Isn’t it cool just to be able to see such amazing species in the wild? My herping has been limited to the USA and Caribbean thus far. Thank you very much for the positive comments. You are correct – those who are lucky enough to live in Bangkok get to see many fascinating species that make lots of wildlife enthusiasts envious. So happy to find this site! Great job!!!! Back in the states keeping and breeding snakes was a big part of my life, but not so much here. Anyone know of a herper group in Bangkok? I would love to meet up with fellow reptile enthusiasts. Also I’ve been coming across a lot of very tiny frogs on Silom (mush smaller then a 25 satang coin.) In front of the main Bangkok Bank Branch there is a garden full of them as well as several places on Sathorn. Anyone know what they are? I’m not aware of any herper groups in Bangkok. The only place I know of to find people involved in herping is at the National History Museum or at the universities. The tiny frogs you are seeing could be recently transformed froglets of any species, but I would bet on one of the microhylids. I should be able to finish the frog portion of this site in the next few months, and then you’ll be able to make a better comparison. Excellent website! I was able to identify a couple of frogs I photographed recently in Siem Reap from your photos. Thanks! Hello, Are you still located in Bangkok? I plan to be there in a few days. Let me know how I can contact you for more info. Best. Have the pleasure today of seeing a photo serie of what I believe is a long tailed sun skink catching, killing and eating a large scolopender. The scolopender is around 15 – 18 cm. In the end eaten still being longer than the belly of the skink. – Are there any particularly good spots for seeing these monitors in the park? – Is feeding (e.g. on fish from the lake or scraps from people) commonly observed? If so, how often (daily)? – is there are particularly good time of day for observing the monitors? Also, I have been reading your blog and listening to a podcast interview about reticulated pythons in Bangkok’s waterways and canals. Are there any good spots where we are likely to see a large specimen? We really like the idea of featuring the fire department being out on a snake call to catch a large retic python and release it somewhere safe. How likely do you think it is to be able to achieve this? how much time do you think we will need? Our main worry is that the pythons are difficult to find and are seen at random throughout the city, making them very hard to film. Thank you very much for taking the time to read this message. I would really appreciate any help and look forward to hearing from you. Dear sir or miss I am asking permition to use your photo in my ICT project. Hello! Your blog is very informative! I really enjoyed reading it. I will be in Bangkok for work but I have a single night to look around for frogs. Would you have any site/area/place to recommend with a high probability to see a few species? Thank you! Good luck in Chiang Mai. And be careful with even the little monitors – I have a nasty scar on my knuckle from when one took a bite out of me in Manila a few months ago. Was extremely careful with the clean-up and disinfecting, otherwise it could have been even worse. At our hotel in Bangkok on the river we discovered a baby water monitor. It was stealing scraps under the tables at breakfast and hunting for earth worms on the edges of the lawn and in the bedding. At least thats what we think it was hunting. It was so small non of the other dinners noticed it. They are particularly lovely as babies and very intelligent with a good sense of smell. It only ever appeared at breakfast and dinner. I think the waiters new it was there as every time it saw one it vanished behind a post or ducked into the heliconias. I know they can swim pretty well but reckon it hitched a ride to the hotel on an island of floating pig weed as the river was full of it, more than I’ve ever seen. No more than a hatchling. Yes quite right never molest the wildlife, I get so tired of seeing idjiots on TV grabbing every snake they encounter. It’s just not the way for the viewer or the idjiot to observe snakes in the wild, making very poor natural history television. When I see a snake my reflex is to immediately retreat a few steps, this allows it to feel less threatened and mostly they will then advance happily. Then I watch it and mostly I always see it doing something interesting weather its hunting or going for a drink, laying eggs basking etc etc that’s what we want to see not some idiot strangling it. Only one time I hurried along a large fat puff-adder that had decided to lie in the sun on a hikers trail on the weekend, believe me I used a very long stick, it was no more than a twig in diameter but it worked, it huffed and puffed growing twice the size then left with a few gentle prods. Hi! I’m an adjunct professor at ChulalongkornUniversity, faculty of architecture, and I’m preparing a design studio, starting next semester, related to the urban wildlife in bangkok (looking at the city with a non anthropocentric perspective). It would be great if I could contact you to ask for some information, and maybe organizing a meeting with students. Could it be possible? Thanks in advance! Thank you very much for your interest! I’ll be in touch. Your blog looks really interesting, especially as it’s just helped me to identify a lizard. Do you have an option to submit photos? Yes, I’ll use photos from anyone, although I don’t have a huge amount of time to update the site recently and there are only a couple species that I really need photos for. What species are you speaking of? Ah, I see. I enjoy nature photography, although I’m no professional, so you’d be welcome to any of my photos. To be honest, they’d probably be more common species of lizards, and the odd dragonfly and damselfly. The problem is, I don’t know what the dragonfly and damselfly photos are of (except Common Clubtail). You do take beautiful photos! Several of them would certainly be a great addition to my site. I’m on a speaking circuit right now and thus a bit too limited on time to add them, but I’ll keep it in mind and tell you when I have a bit of time to add a few. Hey Matt, I finally got around to adding a couple of your pictures. The colors are vibrant. You can see on the Golden Tree Snake page (https://bangkokherps.com/2011/05/01/golden-tree-snake/) and the Indo-Chinese Forest Lizard page (https://bangkokherps.com/2011/09/20/indo-chinese-forest-lizard/) as well as the front page. Thank you!